Today I am going to share a very simple dish using the homemade salted eggs from my previous post. Ochazuke is rice in green tea normally accompanied by a variety of condiments, nori, and leftover side dishes seasoned with a little salt or soy sauce. 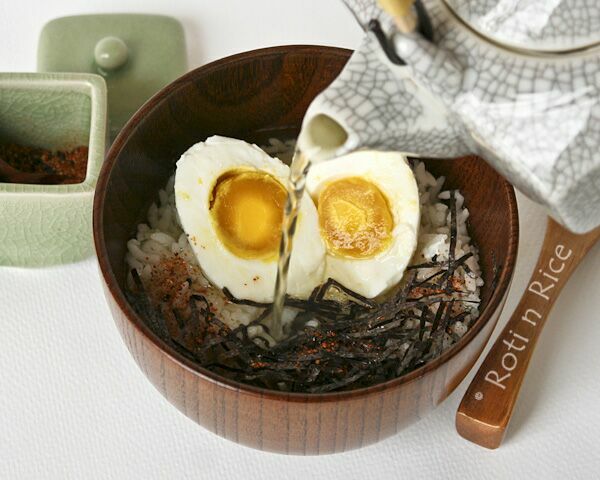 Salted egg makes a wonderful accompaniment to ochazuke as it provides just the right amount of flavor when mixed with tea. Best of all, it is a breeze to prepare, yet is so tasty and satisfying. Ochazuke is great for breakfast. It can be made as simple or elaborate as desired. The ease of preparation makes it suitable for students living on campus needing a quick and simple breakfast. 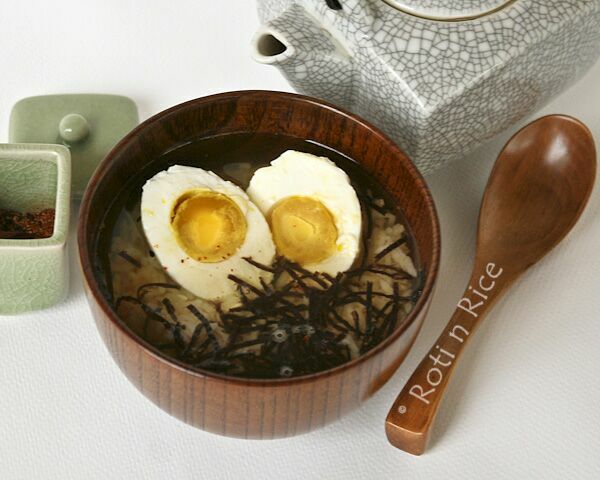 This dish can be easily prepared in the dorm by boiling a regular or salted egg and brewing a pot of green tea. There is minimal cooking and mess. 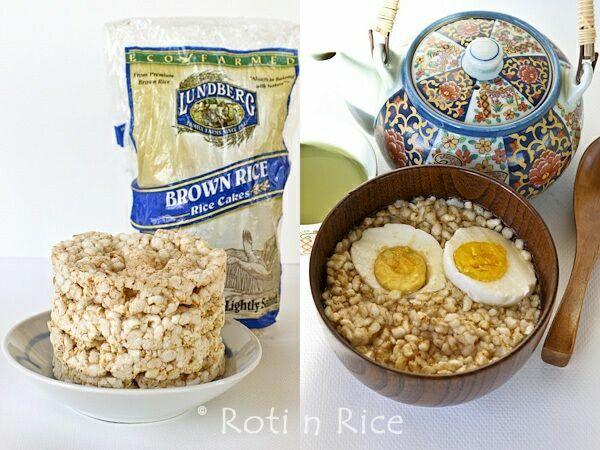 The cooked rice may be substituted with dried brown rice cakes available at most health food stores. We couldn’t have chosen a better week for campus visits as the weather was just gorgeous. It was bright and sunny with temperatures in the 60’s, perfect for outside tours. 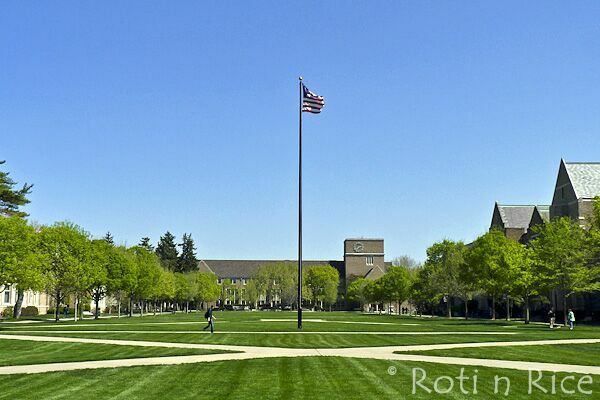 Our first stop was the University of Notre Dame, Indiana with its classic collegiate Gothic buildings. The campus began in late 1842 with 542 acres and now sits on 1250 acres of land with two lakes. It has about 12,000 students. 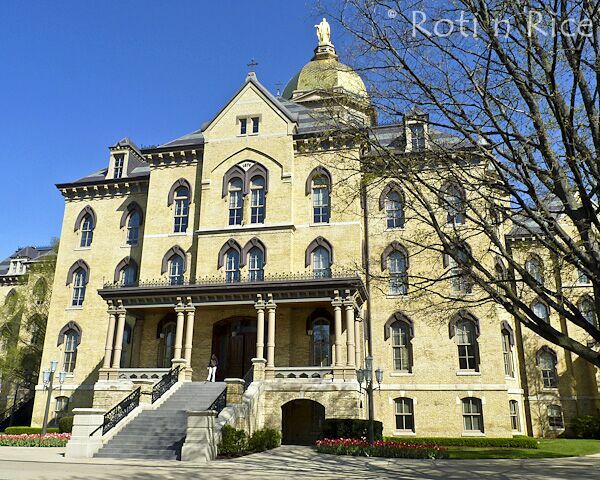 This is the main building with its famous Golden Dome which serves primarily as a headquarters for administration. This is the view of South Quad from Notre Dame Avenue. Definitely a campus with the WOW factor! 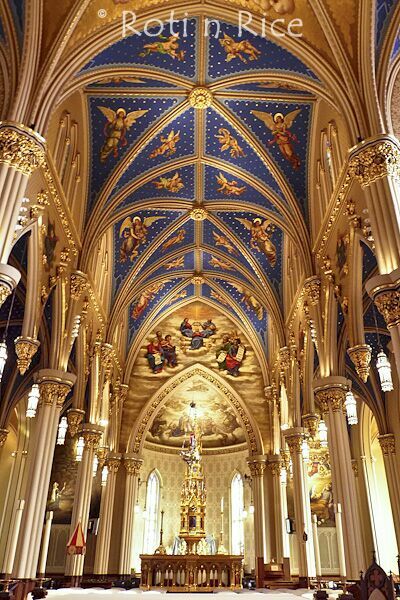 The magnificent, Gothic-inspired Basilica of the Sacred Heart with the largest collection of 19th-century French stained glass in the world. Beautiful artwork fills this space. 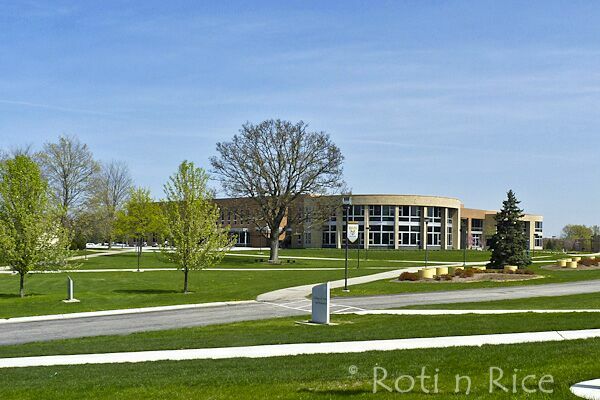 Our next stop was Valparaiso University also in Indiana. This university was founded in 1859. The campus sits on 320 acres of land and has 4,000 students. It is a smaller university with solid courses and a nice and more contemporary feel to it. The modern era of this university’s history began in 1925 with purchase of the institution by the Lutheran University Association, a group of clergy and church laity who saw a bright future for the University. 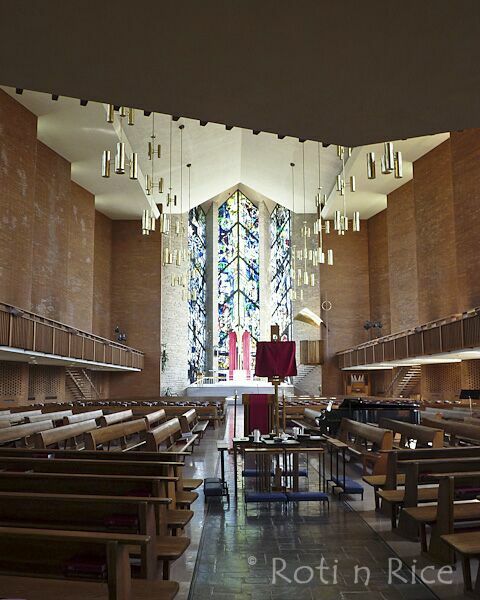 Shown here is the inside of the Chapel of Resurrection which has seating for more than 2,000 people. From Indiana we traveled north into Michigan to visit the University of Michigan, Ann Arbor founded in 1817. 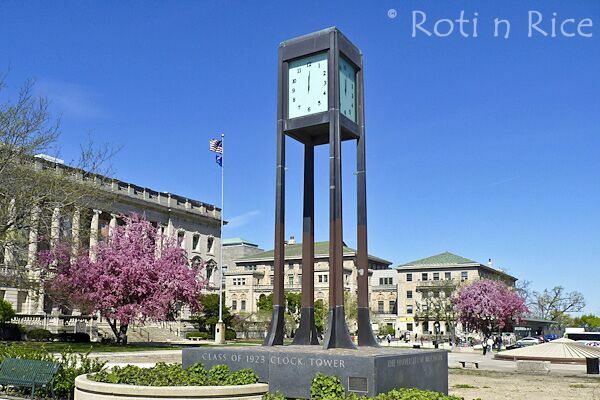 This is the states’s oldest university and the flagship campus of the University of Michigan. It has two other campuses in Flint and Dearborn. There are more than 58,000 students on those three campuses. Shown here is the Law Quad with its Gothic-style buildings. 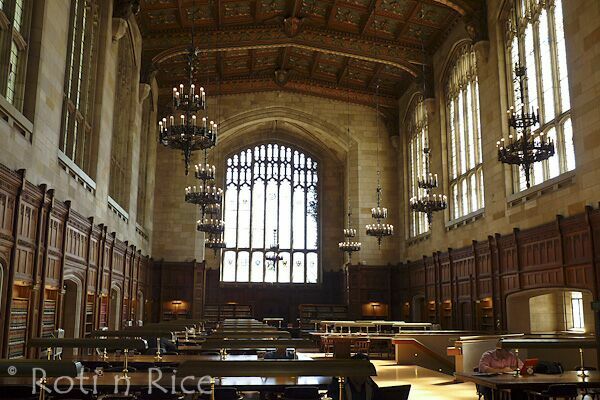 University of Michigan is a research university and has very impressive research facilities and capabilities. This is the inside of their Law Library. Finally, we headed back south and west through Indiana and Illinois and then north again into Wisconsin to the University of Wisconsin, Madison founded in 1848. 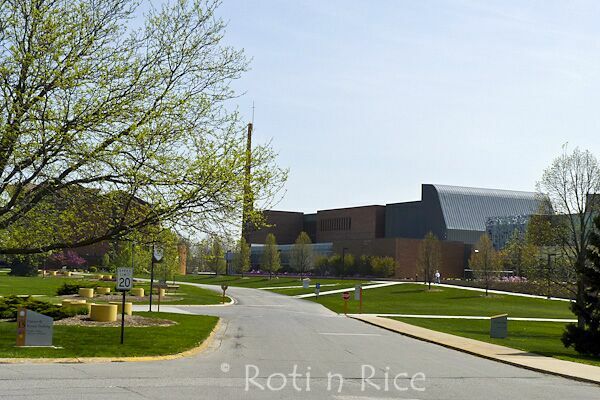 This beautiful campus sits on 936 acres of land and has over 42,000 students. Many students from Minnesota come to school here because of its proximity and reciprocity agreements between the two states. 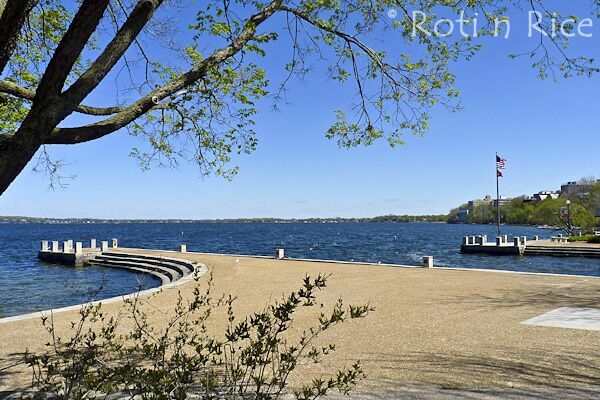 Shown here is Memorial Union by Lake Mendota, not far from the university’s Lakeshore Residence Halls. 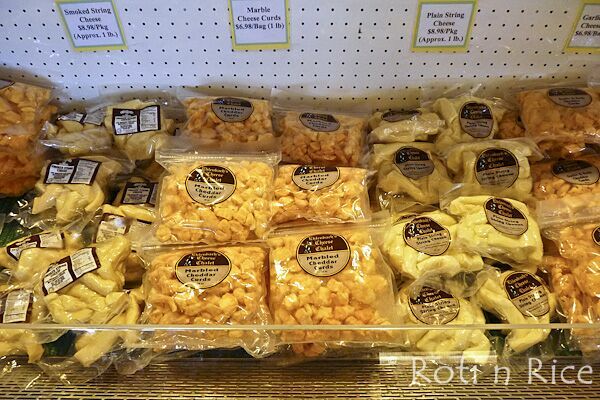 When in Wisconsin, what do you think of? CHEESE of course! 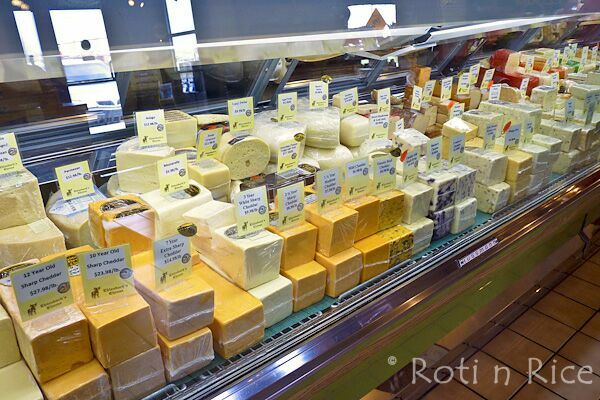 This is the cheese counter at Ehlenbach’s Cheese Chalet. Love the fruit cheeses, especially the ones with blueberries and cranberries. 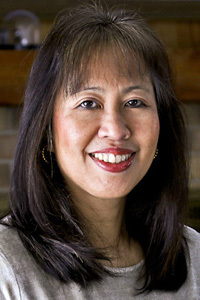 Like Denise, I’m also a fan of Ochasuke. I used to make this when I was living in Japan. It’s interesting to pair with salted eggs. Biren, I admire your patience & determination to explore the schools for your boys so far in advance 🙂 Kudos to u, dear! It is good to explore early so that they get inspired and work hard to achieve their goals. It is also fun to visit those campuses. I love Ochazuke and used to eat it as midnight snack when I was younger. Now I have to reduce the amount of carb so I can’t do it anymore, but it’s such a comfort food. Salted egg (Chinese) + Ochazuke (Japanese) is a great fusion food!! What a great recipe Biren! Seems like you had a great trip to check out colleges. Beautiful campuses and oh it’s so hard to pick which one to go! You are so right about it being hard to pick a college to go to. So many to choose from. Wow that church looks stunning! I’m very impressed by how you tied in the recipe to the college visits by showing how it’s dorm-friendly. Nice. American campuses are so much quieter and leafier than their European counterparts. Here universities are typically spread out in and around an urban landscape, forming part of the town. It’s a different dynamic, but as a parent sending a child off to one, I think I’d appreciate the more cloistered feel of the American model. Looking forward to the next chapter in your campus tours! Ocha works in the dorm as it is so easy to prepare. I have yet to try ochazuke, but your post makes it so simple to prepare – your recipes have never fail for me. I think I will like the interesting contrast in taste, looking forward to trying it very soon. You know what, U of Michigan, Ann Arbor and U of Wisconsin, Madison were the only 2 american universities I’d shorlisted for myself when I was in high school in Canada. No road trip though, only glossy thick (and not as exciting as a visit) prospectus to read up on to make the final decision. Thanks for sharing, it is really nice to read all about it and see the lovely architecture. Thanks for your compliment. I think you will enjoy this dish. It is so simple yet satisfying. You can combine whatever leftovers you have and it will taste good. A quick and delicious rice dish. I made something similar years ago, but with oolong tea. I always learn so much from you in the cooking department, Biren! This sounds really good and I’d love to try it. Good luck with the college search. I remember those days with our two sons; so many options and decisions to make! this is something I have never heard or seen before but its so intriguing and just beautiful with the salted egg. 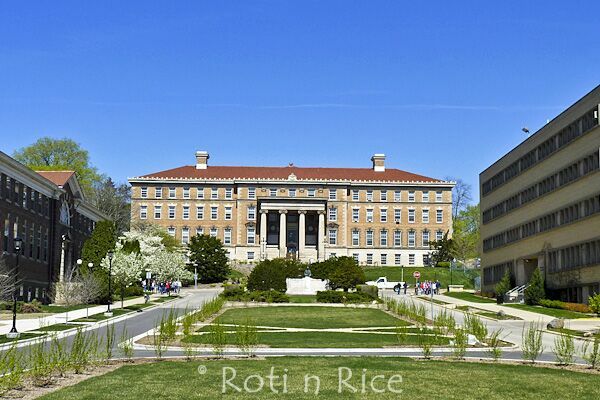 The pics of the campus are gorgeous! 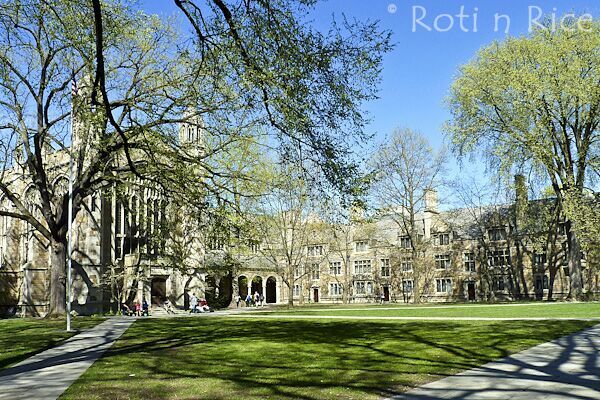 Hello Biren, what a lovely post, I love this Ochazuke and the campus pictures are amazing! A healthy & refreshing meal! The campuses are all so gorgeous! That was quite the college visit trip! Hope your kids will find the college they love! Love your tea sets, Biren! I love learning about new dishes and this looks delicious, Biren! All of the college campuses look so nice, too. Thanks for sharing! Wow that really is quick to prepare! And it sounds like something I definitely should give a try. I’ve been looking forward to your salted egg recipes! Sounds delicious – and easy to make, too. What could be better! Your campus visits take me back. Some time ago I used to be an editor for college textbooks, and a lot of my time was spent visiting campuses to visit with authors, etc. I’ve been on all 4 campuses you’ve profiled, plus I’d guess at least another 125 or so in the US. All 4 of those schools are decent, but U/MI and U/WI are really top notch. Thanks for the recipe, and enjoy your future campus visits! This is a perfect dish for the dorm! When I was in college all I had to cook with was a popcorn popper and that was a real challenge. 🙂 Love the use of green tea! Enjoyed the tour of the campus! Thanks for the tour! Biren, this dish sounds so interesting. I like to make my rice with green tea sometimes. I love the Japanese seven spice, my sister gave me a bunch of it for Christmas because I use it so much. I must try this dish! What an interesting dish…I adore these types of easy dishes for lunch 🙂 Looks like you had a great trip visiting the campus.